The first thing to do when your hard disk starts showing error or stops showing up on your computer is to check if it’s a physical hard disk problem or a logical hard disk problem. Logical hard disk problems can be solved using a good DIY software or utility, while the physical disc problems need you to take the device to a hard disk recovery center. There are so many hard disk repair solutions in the market today, but the inbuilt solutions are still handy in resolving logical hard disk errors and problems. The Chkdsk utility is one such Windows 10/8/7 in-built solutions for checking and repairing corrupt hard disks. We’re about to discuss “Chkdsk utility” and how you can leverage it in checking and repairing corrupt or inaccessible hard disk. In addition to that, we shall be discussing the best solution to recover lost hard drive data and files. Part 2: Data Lost After Hard Disk Have Been Repaired? Easily Recover Any Lost Data! The best way to check and repair hard disk error in Windows computer is by using chkdsk utility disk repair. The chkdsk utility is an inbuilt Windows 10/8/7 utility or program for checking your disk and fixing hard disk drive errors. The CHKDSK utility scans the hard disk, repairs logical sector errors, marks bad sectors that can’t be fixed in the hard disk, and moves your data to healthy sectors of the hard disk. The chkdsk utility is a handy disk repair tool, but this utility does not operate automatically; you must manually start it. Moreover, the chkdsk utility is not for every computer, but for PCs with hard disk drives HDD. Hence, if your computer has a Solid State Drive, the chkdsk utility won’t be necessary for repairing the disk when an error occurs because the SSDs come with their own inbuilt repair utility. Step 1. Open “File Explorer” on your Windows 10 computer. Step 2. On the left-hand navigation panel, click “This PC”. Step 3. Look at the main part of the window under “Devices and drives” and right-click on your primary disk drive (it’s usually labeled “C:”). Step 4. Select “Properties” from the menu, and in the window that opens, select “Tools”. Step 5. At the top of the new window, there should be an option that says, “This option will check the drive for file system errors”. Click the “Check” button. Step 6. Another window may appear saying that the Windows hasn’t found any errors, you should proceed to check your device anyway by clicking “Scan drive”. To repair errors, just select the “Automatically fix file system errors” box and click “Start”. 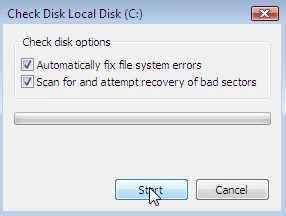 To repair errors and scan for bad sectors, select “Scan for and attempt recovery of bad sectors” box and click “Start”. To run the utility in read-only mode, just click “Scan”. Step 2. Once the scan is finished, the chkdsk utility will either notify you that “Errors were found and fixed” or “No errors were found”. After the repair process, your hard disk should be working effectively again. Data Lost After Hard Disk Have Been Repaired? Easily Recover Any Lost Data! If you lost some of your important files and data on the hard disk after using Windows chkdsk utility disk repair in repairing your corrupt, damaged or bad hard disk, you will have to use third-party data recovery software in retrieving your lost data back. iMyFone AnyRecover is the best hard disk data recovery software that can restore data lost from software crash, lost partition, raw file system, formatted hard disk, virus attack, and other data loss situations. 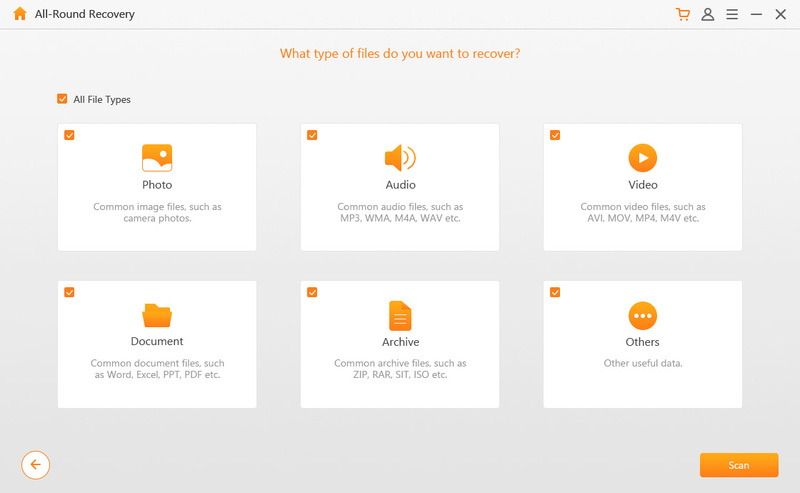 You can download this recovery software right now to start recovery your lost file instantly. 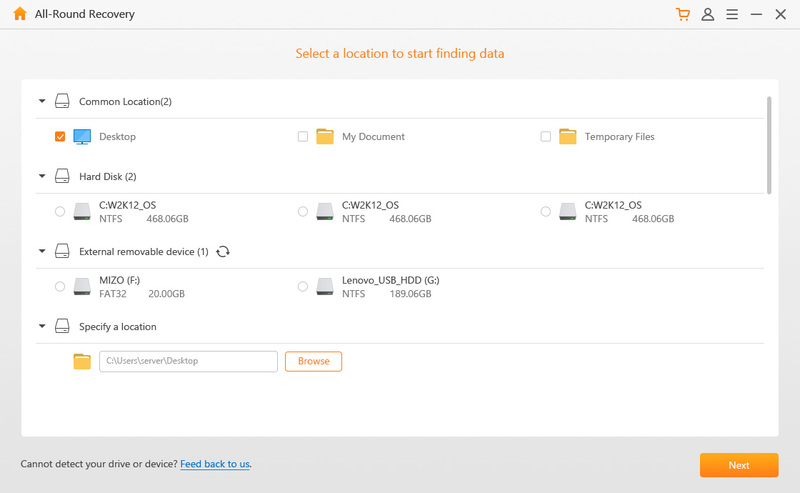 Recover lost and damaged files as easy as possible. Offer a unique data recovery algorithm for recovering an unlimited amount of data. Recover hard disk files that are lost from any data loss situation or condition. Recover all sorts of data such as mistakenly deleted files, formatted files; files deleted from recycle bin, etc. Step 1. 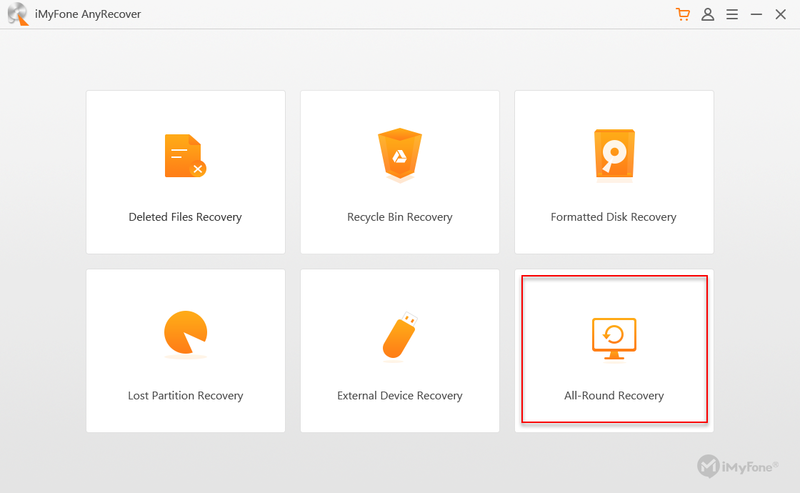 Install and open AnyRecover on your PC or Mac, then select the “All-Round Recovery” mode. Step 2. Select the location where you lost the data, and click the “Next” tab. Step 3. Check the type of file you want to recover, and then click “Scan” tab. Step 4. Once the scan process is completed, the files will be presented to you for preview, go through them and select the ones you would like to recover. Then, click the “Recover” tab. Note: Please, select a new location to save the recovered files. Mechanical damage of the solid-state disk. Manufacturing defects that came with the hard disk. Overheating of your laptop or desktop computer. Electronic failure of the sensitive electronic components of the hard disk. File corruption due to virus attack.